Way back when my career was just starting, I got a job with a physician who was involved in auto-accident managed care. This meant that there was a steady stream of neck-injured patients. While many of these patients could be helped, some couldn’t. While it would be attractive to say that these few had psychological issues, what was bizarre was that they all had similar exams. So either all these people got together at night and corroborated where to say “ouch” when I pressed in specific places or they all had a real injury. Eventually, I figured out that they had CCJ instability, but there was never a reasonably effective treatment that didn’t involve incredibly invasive surgery, until now. So here’s an update on our novel alar and transverse ligament treatment. What Are the Alar and Transverse Ligaments and CCJ Instability? The craniocervical junction (CCJ) is located at the neck where the base of the skull (cranio-) meets the top of the spine (cervical) at the atlas bone, or the C1 vertebra, through the axis bone, or the C2 vertebra. C1–C2 allows 50% rotation of the head, making it the most mobile joint in the spine. CCJ instability occurs when the head is not firmly connected by the alar, transverse, and accessory ligaments to the neck, causing the upper neck and head to move too much. These ligaments can become injured or stretched with trauma, disease, or both, putting excess pressure on the spinal cord or nerves and causing chronic neck pain and headaches at the back of the head, arthritis, dizziness, cognitive symptoms, and many other issues. CCJ instability is difficult to treat. In a typical CCJ patient, activity makes everything worse, manipulation to relieve severe headaches is only temporary, PT usually flares up symptoms, interventional care focused on the upper cervical facet joints only helps a little bit, and so on. Attempts to tighten these ligaments through injections like prolotherapy is in vain as they can’t be reached, and tightening other ligaments will often only provide slight improvements, and surgeries for CCJ instability (e.g., fusing the bones together with screws, metal plates, and/or rods) are highly invasive and are associated with serious side effects and severe injury rates. This treatment challenge for CCJ instability led us to our first-of-its-kind alar and transverse ligament injections, and after a couple of years of doing these injections, I want to update you on the procedure. I first shared our novel alar and transverse ligament injection procedure for CCJ instability and how it is helping our patients avoid invasive surgery with you last year (see the April 2016 video at this link). This post and the new video (see above) is an update on the procedure. We cannot access these ligaments using a posterior approach (meaning through the back) because the spinal cord is in the way, so we use an anterior approach through the oropharynx, which is the part of the throat that sits between the back of the mouth and the upper-cervical vertebrae. This procedure requires a full surgical prep, using full and specialized anesthesia that thoroughly puts the patient to sleep and dries out the airway. An oral-airway device is inserted (you will see this yellow device in the video), which keeps the tongue out of the way and allows direct visualization with endoscopy of the back of the throat. 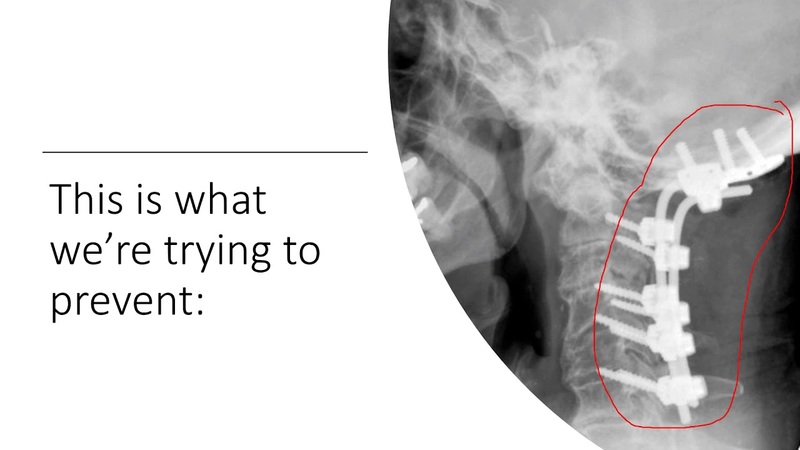 A long, thin needle is inserted through the back of the throat (posterior oropharynx), through a small articular gap between the cervical vertebrae, and into the alar and transverse ligaments using precise fluoroscopy guidance. Contrast is injected to assure proper placement, and then we inject HD-BMC (high-dose bone marrow concentrate), a super-concentrated mix that contains, among other cells, the patient’s own stem cells, into the damaged ligaments. I had mentioned in last year’s post that prior to our new alar and transverse ligament injection procedure, that traditional cervical facet and other injections only provided temporary or minor relief in our CCJ patients. When we discovered a way through an anterior approach (the oropharynx) to access the critical alar and transverse ligaments buried deep in the spine and inject those, we began to observe some substantially positive results in these patients, which were just a handful at the time. Over a year later, we’ve now performed this procedure on approximately 30 patients, approximately 50 times, and we’ve seen excellent life-changing results for many of these patients without significant complications. In addition, this procedure seems to be able to prevent incredibly invasive surgical fusions that bolt the neck and skull together, stopping the movement of the most mobile joint in the spine. Are You a Candidate for an Alar and Transverse Ligament Injection? While we’ve been doing the alar and transverse ligament injection procedure for CCJ instability for a couple of years now, the procedure is still new, so we do have strict candidacy criteria for it. A number of issues are considered for each patient, such as the patient’s prior injection history, response to other therapies, symptoms, and exam (are they consistent with CCJ? ), as well as the results of specific types of imaging (e.g., digital-motion X-ray). Find more in-depth information about candidacy in my post at the link above. The upshot? We are cautiously optimistic that this procedure can help most CCJ instability patients avoid the need for incredibly invasive cervical fusion. For now, this is a Colorado-only therapy. We will be starting a randomized controlled trial very soon as well, which will be single blinded (meaning patients will either receive the treatment or not and be unaware if they had the therapy). I’ll update you on this procedure once we get closer to 100 procedures. Having post knee replacement surgery pain problems together with neck pain clearly I am interested in new developments. I'm 11 months out from my CCJ procedure, and you're spot on - it is life changing! My quality of life is exponentially better and still improving. I cannot thank you enough for your courage to try new and innovative procedures. You are a true gift to those of us labeled as a "challenging" patient. Thanks Allison, I really appreciate that! Challenge inspires innovation! When will the study be taking place? Any updates for 2018 on this? How many procedures completed now? Approx. 65-70 procedures performed. Results still good, minimal complications/side effects. Have any of your patients been under upper cervical chiropractic care prior to the procedure? If so, were results good with these individuals? Yes, most are receiving upper cervical chiropractic at the time of this procedure. it's usually the only thing that provides temporary relief. Are you still accepting patients for this procedure? I believe my 16 year old daughter is a candidate - DMX shows almost 12mm overhang on lateral bending and dMRI confirms high grade lesions of both alar ligaments. Also thinning and disruption of tectorial membrane and transverse ligament bilaterally, and a myodural bridge dural defect in the POAM. Yes. Here are 2 more recent updates: https://www.regenexx.com/candidacy-for-ccj-instability-procedure/ and https://www.regenexx.com/ccj-instability-trial-begins/ What treatment has she received, thus far? Thank you for such a prompt reply on a Sunday night! She has had 6 prolo sessions with guidance (2 dextrose, 2 single spin PRP, 1 double spin PRP, 1 stem) all posterior but without contrast. Performed in Fort Meyers FL. How many of these procedures have been preformed to date? or is the test similar at any clinic doing the DMX? About 100. The DMX needs to include a side bending open mouth C1-C2 view, which should be standard.